Ulric Nijs, celebrity mixologist for Tigre Blanc shares pointers on how to play bartender at house parties with studied confidence. 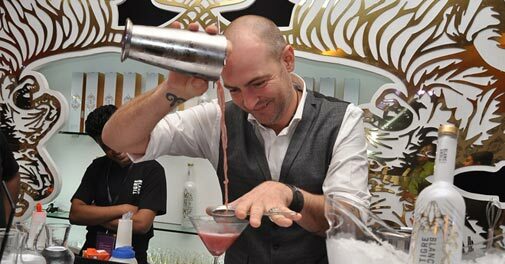 These pointers from Ulric Nijs, celebrity mixologist for Tigre Blanc, ensure that you stay on top of your game as you swirl, dip and stir with panache. Sweet cocktails were the rage a while back but seasoned partygoers are increasingly opting for savoury cocktails because of the complexity of their flavour. Inventive use of vegetable essence gives cocktails the required zing, but it's important to take note of its proportion in the cocktail since they tend to be intense in texture and flavour. The taste of fruit or vegetable essence should not overpower the flavour of the base spirit but should just make it mellow. The juice used in cocktails should be freshly squeezed - this enhances the aroma. Packaged juice, which contains preservatives, dilutes the punch that the cocktail is capable of delivering. Use big clear ice cubes, which enhance the chilling effect, instead of many small ones that hasten the process of dilution. Settle for ample carbonation - use cocktail shakers that are pressurised with carbon dioxide. Put the ice, liquor, mixer and fruit inside, pressurise and shake for five seconds to get the best consistency for a cocktail. It is advisable to not mix more than two base spirits (vodka, gin, whisky, tequila, brandy, rum) and be sure to draw the line at more than three base spirits. This reduces the drink to a 'let's get drunk' concoction and deprives you of the joy of truly savouring the acidity of fruit blended in the smoothness of vodka or gin. Generously incorporate Indian ingredients, including spices and black salt, in your homemade cocktails. You will get the hang of it soon enough, so don't be apprehensive of experimenting. Some classics like chilli with pineapple or nutmeg with pineapple are very complementary combinations. Some of the ingredients that are becoming incredibly popular are orange flower oil, celery oil and angostura bitters. A little style never hurt anybody. When you're behind the bar, bask in the flamboyance of your role and don a fitted waistcoat. We also recommend hats with narrow brims if you can pull it off. Go ahead, be the trendy bartender. Side effects of pulling this feat off could be that your friends decide to skip the pub visit and head to your den instead.